Rooted in the belief that we learn the most through hands-on experience, UMBC instrumental music education majors gain six semesters of classroom teaching, including a weekly service-learning internship during their 1st and 2nd years in the program. 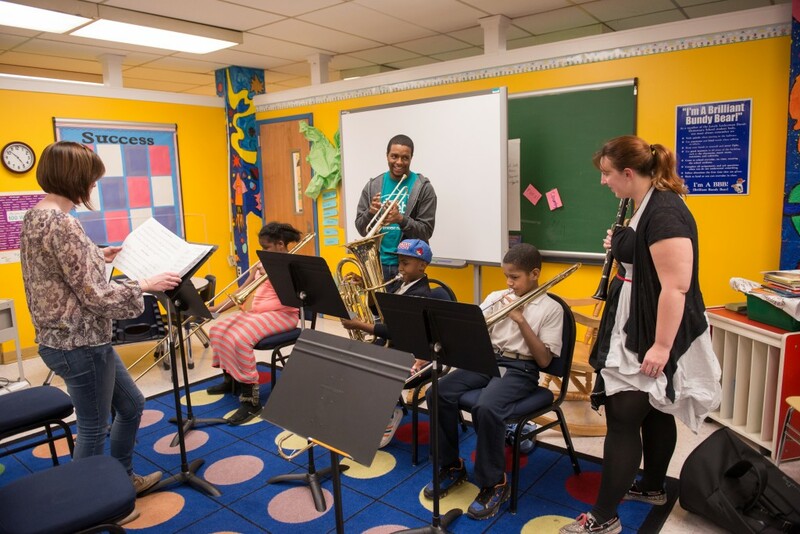 UMBC music educators work with students at local schools, which includes time in the Baltimore Symphony’s OrchKids program. The real-world work experience allows UMBC students to positively contribute to the community while taking on opportunities such as side-by-side rehearsal with Baltimore Symphony members and clinics with major guest artists like Tony award winner Brian Stokes Mitchell. In their final year, aspiring music educators are placed in an area school; the year begins with observation and gradually expands to a full-time teaching internship. In addition to our exceptional faculty who are all practicing teachers and active performers, students are exposed throughout the degree program to many top thinkers in the fields of music and education; recent guest speakers include leaders from major institutions including the U.S. Department of Education, International Society for Music Education, Carnegie Hall, NPR’s from the Top, and Americans for the Arts. Program graduates are currently employed as teachers in counties across the state of Maryland and beyond including recent graduates in California and South Korea.